Although the Space Shuttle program was approved in 1972, many engineers and space enthusiasts regarded it as merely the first step towards truly low-cost space transportation systems rather than as an end in itself. Robert Salkeld of the System Development Corporation was a strong proponent of next-generation fully reusable shuttles and published several comparative analyses throughout the 1970s, most notably in Astronautics & Aeronautics and other AIAA publications. He felt the key technologies currently being developed for the Shuttle (e.g. main engines and thermal protection system) also could be used on smaller fully reusable spaceplanes. Most designs were based on the "tripropellant propulsion" concept. Hydrocarbon fuels such as kerosene or JP-5 have a higher density than liquid hydrogen fuel. This reduces the size and weight of the propellant tanks, but hydrogen produces a much higher exhaust velocity which means less fuel is required. Salkeld suggested it would make sense to use both hydrocarbon and hydrogen fuel. The high bulk density of hydrocarbon fuel is quite important during launch, when high thrust matters more than exhaust velocity. Later on, the vehicle -- now considerably lighter -- switches to highly efficient oxygen/hydrogen as it leaves the atmosphere. Salkeld's first concepts from the 1960s were based on the Lockheed C-5A Galaxy cargo aircraft. The smallest version (left) resembled McDonnell-Douglas ILRV but it would have been launched from a C-5A. Its payload capability to a polar orbit was about 1,270kg. Larger 2,270-kilogram payloads could be carried into polar orbit by a fully reusable delta-wing spaceplane launched from an under-wing position by a new twin C-5A configuration. Finally, Salkeld also proposed a low-technology carrier aircraft derived from the C-5A designed specifically for the air-launch platform mission. The new carrier aircraft would have been boosted by its rocket propulsion system to an altitude of 18.5km and a flight-path angle of 45 degrees before releasing the spaceplane from an under-wing position. 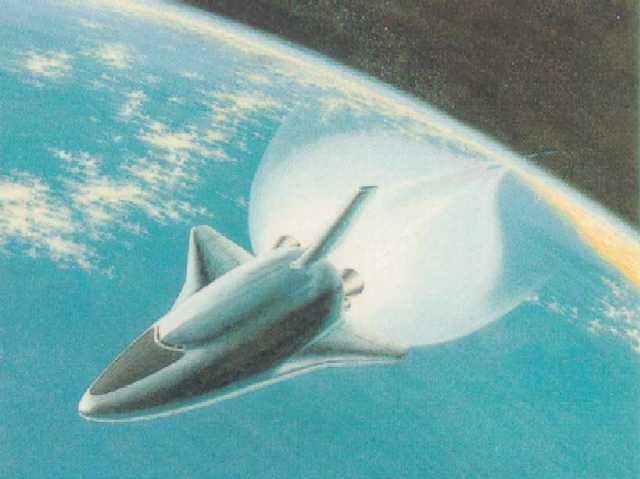 This version of Salkeld's spaceplane could have orbited a 2,000-kilogram polar payload using disposable drop tanks. Salkeld claimed his RLVs launched from large subsonic aircraft would offer flexibility of launch position, heading & orbital rendezvous phasing, greater capacity for self-ferry & use of existing airstrips and lower takeoff noise. Subsonic air-launch concepts also appeared to offer greater on-the-pad readiness and less reaction time than ground-launched RLVs. But neither the US Air Force nor NASA was interested at this time, although USAF would investigate very similar ”Space Sortie” vehicles in the late 1970s and early 1980s. (C) replacement of the entire STS with a fully reusable single-stage-to-orbit Shuttle orbiter. In all cases, the payload capability was specified as 29,472kg to a low Earth orbit. For these three options, the impact of bipropellant vs. tripropellant engines and three different launch and landing modes (VTVL, VTHL, HTHL) were further examined. Option A -- new reusable Shuttle boosters -- does not benefit from tripropellant propulsion since the staging velocity is so low. HTHL boosters would also be impractical due to the huge size and liftoff mass of the Shuttle+ET; VTHL or VTVL boosters would however work. E.g. Boeing's winged Saturn V-derived booster from late 1971 would have had a dry mass of 325.586t and a gross liftoff mass of 2403.132t. For Option B, the new booster would essentially have to achieve single-stage-to-orbit capability with a 120-tonne Shuttle Orbiter as its payload/upper stage. The only feasible configuration for such a large SSTO appeared to be a VTVL. Use of tripropellant propulsion would reduce the weight of the vehicle from (249.475t dry / 2494.75t gross) to approximately (170.55t / 2267.961t). The volume would be reduced as well, since the average density of the oxygen/hydrogen/kerosene propellant combination is 880kg/m3 vs. 352kg/m3 for oxygen+hydrogen. As for the "C" single-stage-to-orbit options, Salkeld estimates a sled-launched HTHL SSTO design proposed by Boeing for the USAF would shrink from (108.862t / 985.202t) to (72.5t / 997.9t) if tripropellant propulsion were used. A launch sled capable of accelerating the HTHL SSTO to a liftoff speed of 660km/h would be required in both cases, although Salkeld suggests the vehicle also might take off nearly empty using the main landing gear for takeoff roll if a heavy-lift tanker aircraft 2-3 times as big as the C-5A Galaxy could provide an in-flight propellant transfer capability. For VTVL SSTO, Salkeld used Edward Gomersall's plug-nozzle design from 1970 as his baseline. This vehicle had a (dry/gross) mass of (109.769t/1335.829t) thanks to the efficiencies resulting from the wingless design + multiple functions of the plug-nozzle engine/heatshield. A tripropellant vehicle would only weigh (90.7t / 1247.4t). The size and weight of a VTHL SSTO would also be reduced from (294t/2721.554t) to a more practical dry mass of 163.293t and 2263.425t liftoff mass. This vehicle would be powered by eight high-pressure LOX+kerosene engines plus two tripropellant engines (LOX+LH2+kerosene) at liftoff. It would be the same size as a 747 jetliner, the projected development cost was $5.3B [1973 $s] and the marginal cost of launching a 43t LEO payload would be $3.64 million vs. $10.52B & $6.4 million for the Phase B VTHL TSTO Shuttle. Although Salkeld felt the Option B VTVL SSTO Shuttle booster could be very useful since it could launch heavy unmanned payloads as well, his favorite ”Shuttle II” concept was a new fully reusable tripropellant VTHL SSTO. The initial version from 1971 was powered by 12 LOX/hydrocarbon booster engines plus two LOX/LH2 sustainer engines. It would have had a (dry/gross) mass of (179.9t / 2239.385t) and the payload carrying capability to a 55deg. 500km orbit would have been 25t. Salkeld suggested the heavy LOX/hydrocarbon engines might be dropped during ascent to further increase the payload capability by up to 25t if all 12 motors are discarded. Separate LOX/hydrocarbon and LOX/LH2 engines would however increase the thrust structure weight & area and also increase the total engine mass (e.g. more engines would be required) vs. tripropellant engine systems. Consequently, Salkeld's baseline vehicle from 1973 used a single type of dual fuel high pressure engine operating at the same chamber pressure as the SSME. The sustainer engines would have burned a mixture of kerosene, hydrogen & oxygen during liftoff before switching to LH2 & LOX as the vehicle gets lighter. Salkeld claimed the gravity losses are reduced by up to 150m/s as a result of more rapid T/W buildup during ascent to orbit, if tripropellant propulsion is used. The total weight savings vs. LOX/LH2 SSTOs could be as great as 25% and the reduction in dry mass & size also reduces the sensitivity to weight growth. "Windjammer" deploys a satellite in Earth orbit.. 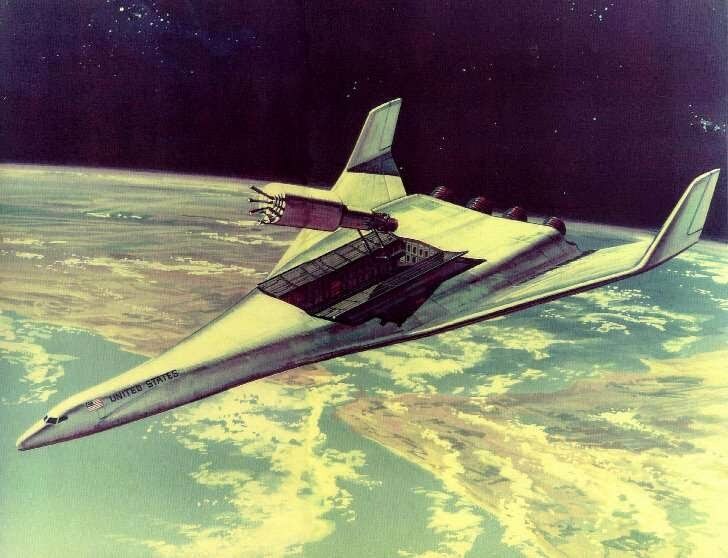 The ”Windjammer” was an early 1970s HTHL SSTO proposal initially developed by Boeing & North American Rockwell and later refined by Len Cormier in 1970-73. It would have been launched from a ground accelerator sled. Salkeld used it as a starting point for his own tripropellant HTHL SSTO analyses and also published some preliminary trade studies on the merits and drawbacks of vertical vs. horizontal launch/landing for single-stage-to-orbit vehicles. He concluded that mixed mode propulsion would produce gains of over 100% in payload:dry mass ratio for VTVL SSTOs and reductions of over 65% in propellant volume and >20% in dry weight. HTHL SSTOs do not benefit as much since the planform area must remain low enough, the sharp reduction in propellant volume might permit tankage (e.g. hydrocarbon fuel "wet wing" tanks) and structural simplifications. In general, vertically launched SSTOs have better growth potential than HTHLs, but they would require new engines (plug nozzle aerospike and/or tripropellant propulsion) whereas HTHL SSTOs such as the Windjammer in principle could use SSMEs. HTHL would however require new advanced structures and a ground accelerator rather than Shuttle-level technology (VTHL) or ballistic technologies (VTVL) and launch facilities. Vertically launched SSTOs could in principle be launched in any direction (range safety permitting) whereas HTHLs might be restricted to certain orbital inclinations if the vehicle has to make a sharp turn shortly after launch. VTVL SSTO might possibly generate less noise on return & landing while HTHLs could face some limitations during ascent to orbit. Winged HTHL SSTOs have good crossrange capabilities, low reentry planform loading and high subsonic landing L/D. VTHL SSTO also offers moderately good aerodynamics & maneuvering capabilities while rocket powered vertical landing is comparatively unproven. VTVL SSTOs however have no self ferry capability unless the main rocket propulsion system is used and the aerospike engine+actively cooled TPS represents a significant development risk. Consequently, Salkeld rejected the VTVL SSTO for challenging missions such a suborbital freight delivery. In 1976, Salkeld proposed a refined horizontal takeoff-and-landing SSTO. He claimed lighter takeoff gear + tripropellant propulsion may allow all-rocket HTHL SSTOs to operate from standard runways, with its attendant benefits for global rocket transport or launch of small/medium class orbital payloads (=options in choice of orbital heading vs. launch sleds, opportunity for more diverse fleet dispersal + prospects of approaching the general flexibilities & costs of modern low-cost aircraft operation). The B-58 Hustler's takeoff gear weighed 2.35% of the total takeoff mass (1.9% excluding wheel brakes). Salkeld believed this figure could be reduced to 1.5% if the wheel brakes are removed, lightweight materials + high pressure tires are used. Potential problem areas for this concept include engine noise and engine-exhaust impingement of the runway; the solution might be operating from remote bases that have water-cooled runways. Salkeld's baseline "Orbital Rocket Airplane" HTHL SSTO vehicle has an (empty/gross) mass of (127t/644.1t). It was mainly intended for carrying 6.3t payloads to a 370km equatorial orbit or 2.27t to a 185km polar orbit, but suborbital missions would also have been possible. Salkeld felt VTHL SSTOs were better suited for launching heavier satellites as users probably would not require the additional flexibility brought by horizontal takeoff from ordinary runways. The orbital rocket airplane's polar payload capability would increase to 7.7t if a launch sled were used. However, the capability can also be dramatically increased (e.g. 10.886t polar orbit payload) if subcooled oxygen and dense RJ-5 propellant is used instead of kerosene+LOX. The vehicle would carry three 4000psia tripropellant engines (6676KN liftoff thrust) plus two LOX/LH2 orbital maneuvering engines. Salkeld regarded advanced airbreathing propulsion as less cost-effective than tripropellant rocket engines. He noted that although airbreathing RLVs offer several potential advantages over rockets (=reduced takeoff noise, compatibility with existing airport facilities, convential aircraft type HTHL operations, reduced acceleration profile during ascent), hypersonic ramjet engines cannot evolve as direct outgrowths of supersonic airliner or Space Shuttle technology. The aerodynamics (e.g. interaction between engine & airframe) and thermal protection problems also would require new technologies whereas SSTO rocketplanes could be based directly on Shuttle systems such as high-pressure SSMEs, thermal protection tiles etc.. Salkeld concluded high-speed airbreathing RLVs have to be large (=sonic boom problem during climbout & acceleration), and the engines will be much heavier and probably require advanced technologies that will not be available for another 20-30 years. Ground launched SSTO generally seemed more economical than air-launched vehicles although they may offer some operational advantages (e.g. mobile platforms) for small space payloads and suborbital missions. For TSTOs, Salkeld found the GLOW is mimimized at Mach 5 separation if the booster uses jet fuel and Mach 7-8 for LH2 platforms. The hydrogen booster showed clear weight reductions compared to JP bosters. Tripropellant engines may significantly reduce the overall mass of air launched RLVs (e.g. 25-30% orbiter dry mass reduction in the super/hypersonic regime). Salkeld found that hypersonic HTHL TSTOs offer GLOW reductions of 50% compared to SSTO rockets, but the dry weight (and hence cost) is 100-300% higher. He dismissed in-flight refueling and airbreathing-rocket launch platforms since they require technologies which will not be available for 2 or 3 decades. Marginal cost/lb payload estimates (185km polar orbit): $130 for fully reusable Phase B VTHL TSTO Shuttle, $1258 for the Space Shuttle, $76 for triprop. HTHL SSTO, $135-137 for Mach 6-9 HTHL TSTOs.